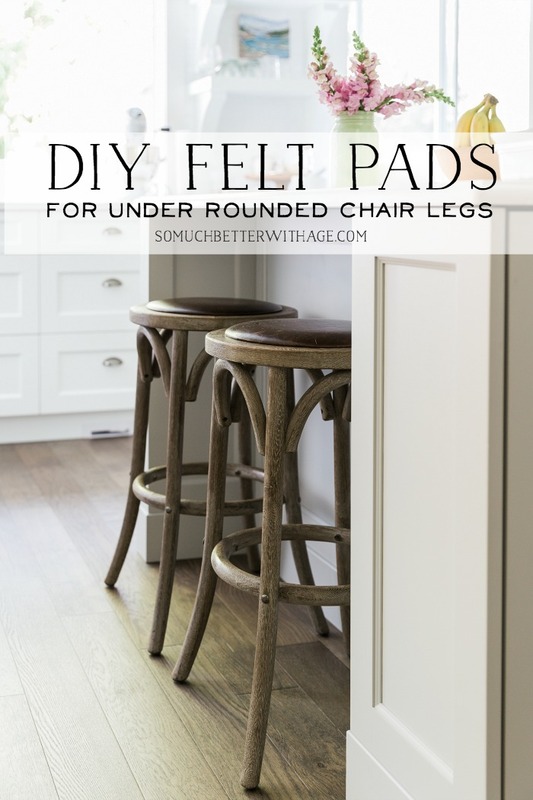 DIY your own felt pads for under rounded chair legs in your home. Have you ever had this problem, you put one of those felt chair pads under a chair leg and it comes right off? Maybe you have chair legs that are rounded like mine. The felt pad just comes off once the chair is pulled out one too many times. 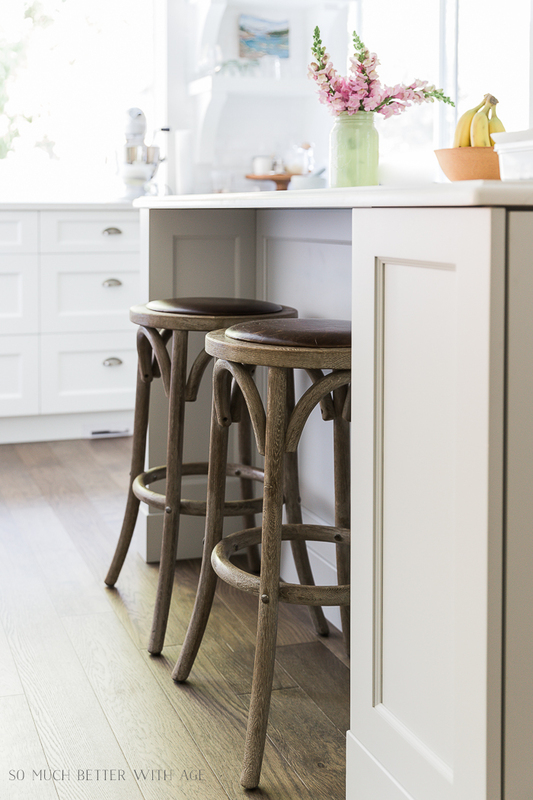 Chair pads are necessary for hardwood and tile floors to avoid scratching the floors and for keeping the legs quiet when the chair is pulled out. 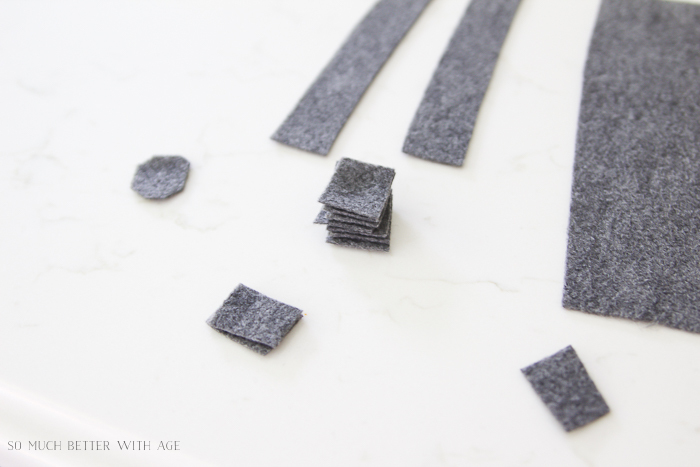 I came up with an easy solution that only requires a few supplies and steps to DIY your own felt pads for under rounded chair legs. 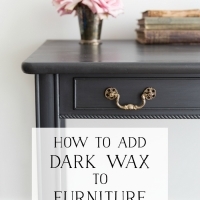 Begin by cutting the size felt you need for the bottom of your chair. 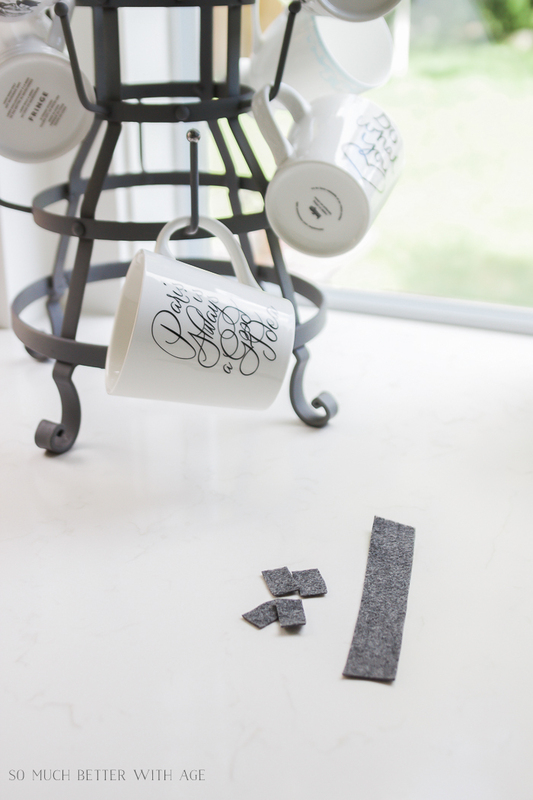 I also add felt pads to my French bottle drying rack (AKA my cup holder) so it doesn’t scratch or make marks on my countertop. I had many ‘legs’ to cover with felt so I first cut the felt into strips then into squares. For the stools around my kitchen island, circles would have been best but I found it easier to cut squares then clip each corner off so that I ended up with an octagon shape. 2. Turn the chair/stool/decor item over and hot glue one felt pad to each leg. And that’s it! I did this project when I first moved in to my house over two years ago and I haven’t had to replace a single one. 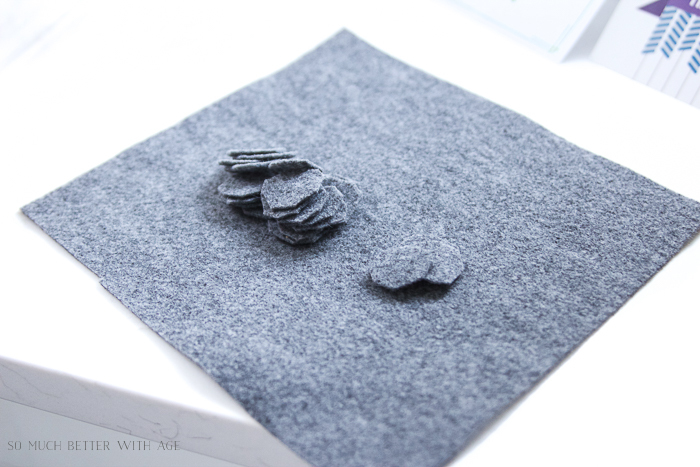 Because the felt pad is thin, which makes it best for fitting on rounded legs, it still makes a bit of noise when a chair or stool is pulled out but it doesn’t scratch the floor. And you can’t even see that the felt is there! 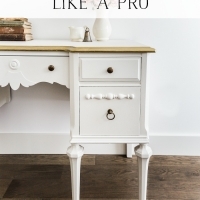 This project is so easy I’m sure you’ll find it useful for so many furniture and home decor pieces in your home. Thanks, this is just what i needed, i bought those others and they are coming off. It seemed so strange for you to have done this today,lol! haha we’re on the same wavelength, Marlene! 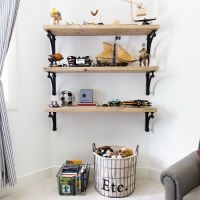 It is a great idea to protect flooring, thanks for the tip! Thank you for this! I have bought the felt with the sticky back and cut it to size but it comes off shortly after…..i never thought to hot glue felt on! working on this soon! I’ve done the same thing as you and they never seem to stay on! This is such an easy fix! OMG! Thank you soooo much. It’s so simple yet I couldn’t think of it. I’ve been driving myself crazy with the stick-on ones. Thanks Kathy! I know, those thick sticker ones never seem to work.